« Closed — One Year Anniversary: “Selene of Alexandria” Giveaway! Conn Iggulden (author of the Emperor series on the life of Julius Caesar) brings us the fourth in his Conqueror series covering the history of the Mongols. The book begins with a very unhorde-like activity…building a city. But quickly moves into palace intrigues as Genghis’ heir, the ailing Ogedai, moves to thwart his brother’s attempt to assassinate him and take over the assembled nation. From there, Iggulden takes us on a roaring ride—all battles, military strategy, and new weapons (including proto-cannons)—lots of blood, death, and unimaginable destruction. Not having lived in or studied this time period, I couldn’t say if it accurately reflects the thinking of the time, but it felt visceral and grounded in the known facts. Iggulden makes good use of everyday details from food, drink, clothes, geography and shamanism to build a world and give us access to it. The settings are sweeping, the descriptions vivid and the myriad characters well-rounded. The story concentrates on that transitional period between Genghis and Kublai as the remaining brothers, sons and grandsons fight and connive for the succession. Very few women make an appearance. The major exception is Sorhatani, the wife of Genghis’ youngest son and the formidable mother of Kublai (later the Great Khan.) Upon her husband’s death, she is given his titles and rights, making her one of the most powerful women of the times. Hopefully we’ll have more of her in the next book. The most fascinating part for me was the Mongol invasion of Europe under the great general Tsubodai. He came across as believable: loyal, ruthless, brilliant at both war and politics. But also tragic, in that with all his gifts, he had no heirs and would never take a ruling role. The strong right arm of Genghis and Ogedai, he was the military power behind the throne. I had a real sense of the terror felt by the Europeans as the Golden Horde destroyed one army after another and slaughtered the people of any city that failed to surrender. The walled cities of Russia, Poland, and Hungary all fell during Tsubodai’s march toward the Atlantic in the mid-13th Century. He had scouts that reached Italy and France. Only the death of a single man, resulting in the continuing struggle for an empire, saved Western Europe from utter destruction; according to Iggulden. 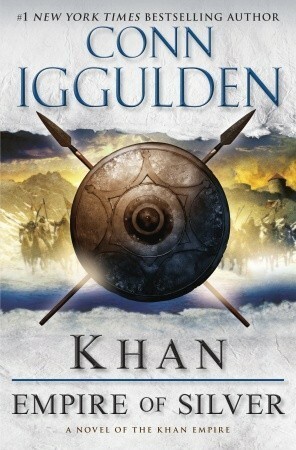 Before reading this book, I knew Iggulden only by reputation. Historical fiction readers on some sites extolled his story telling, but felt he played a little fast and loose with historic facts in his Roman series. I’ve studied the Roman Late Republic and Empire extensively and hate it when an author makes an obvious goof or chooses to ignore known facts. It rips me right out of the story. Luckily, I know little about the Khanates other than a few bald facts, so any errors or stretches went over my head and I concentrated on the story—which was fascinating. Iggulden also provided an extensive historical note talking about his sources and where he “filled in” gaps in the history; probably as a response to earlier criticism. Altogether, I enjoyed my break from the Roman world. This was a fascinating sojourn in a little known (to westerners) time and place. I’d recommend Empire of Silver to anyone who enjoys fast-paced, adventure fiction. I might even pick up one of Iggulden’s Roman books! Please note: I received this book as a free Advanced Review Copy from the publisher through the LibraryThing Early Reviewers Program. The opinions are my own. Read the book too.. really liked it. I Read all the series… especially this one.. really liked it.